A very Prominent and user friendly solution developed by VISIONTEK for vending tickets and monitoring the entire end to sales..
Public transport in developing economies plays a critical role. An efficient and cost effective system increases productivity and connectivity. In the twenty-first century, time is more precious than ever, and people demand products and services they can pay for quickly and efficiently. Cash or contactless operated vending machines are popular in developed countries. However, a different solution is required for developing countries and Visiontek ready with very economic solution with rich features. In recent years, services made available to passengers and commuters have undergone significant changes in developed countries. Ticket vending machines can now be integrated with a central system. They can be used for making payments in cash and cards. 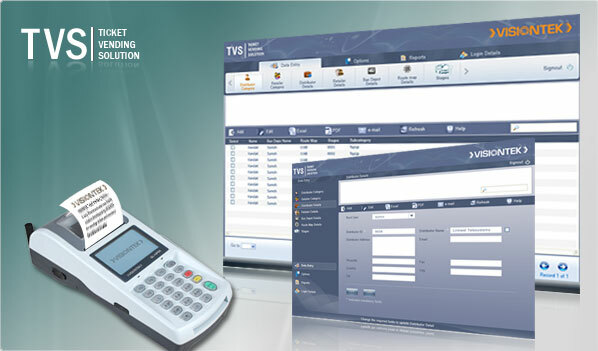 The Visiontek TVS software solution is designed and developed to overcome the problems associated with selling of physical pre-printed tickets, reducing printing cost and storing the pre-printed tickets as also under reporting of the tickets issued. H/W can be configured based on the Solution Architecture. VISIONTEK's Ticket Vending Solution - 18A is an innovative Web-based solution that offers simplified options to cut down the inventory management of pre-printed traditional ticket sales and save the passenger time & hassles. It helps the Management plug revenue leakages.